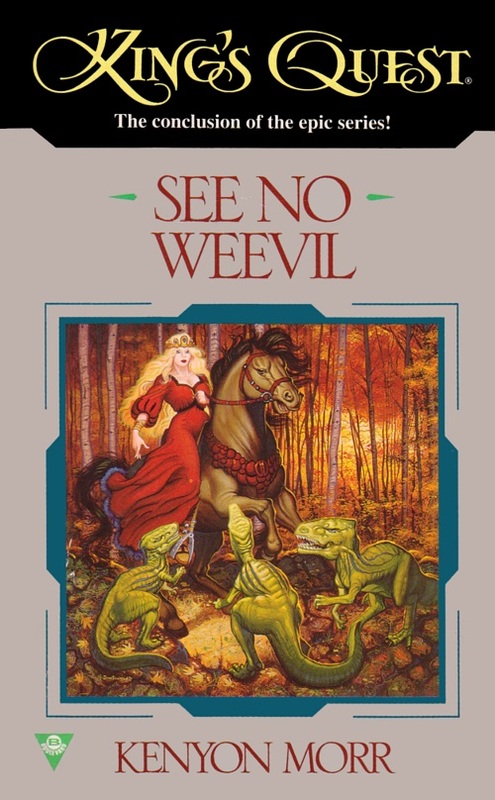 Based on Roberta's Williams King's Quest series, King's Quest: See No Weevil is the third volume out of three King's Quest novels. Sierra had little to do with the books other than licensing another company the permission to write them. Like the second volume, this novel was also written by Kenyon Morr (pseudonym of Mark Sumner and Marella Sands). Rosella feigns an illness to avoid going to a wedding in a neighboring kingdom. With her parents safely out of the way who left Oswold in charge, she begins meddling in kingdom affairs. She "pulls rank" whenever she can, spends money without heed, and scorns and belittles anyone she feels is "less" than she is. This causing a plague of weevils and then lizard-like sloks across the land.